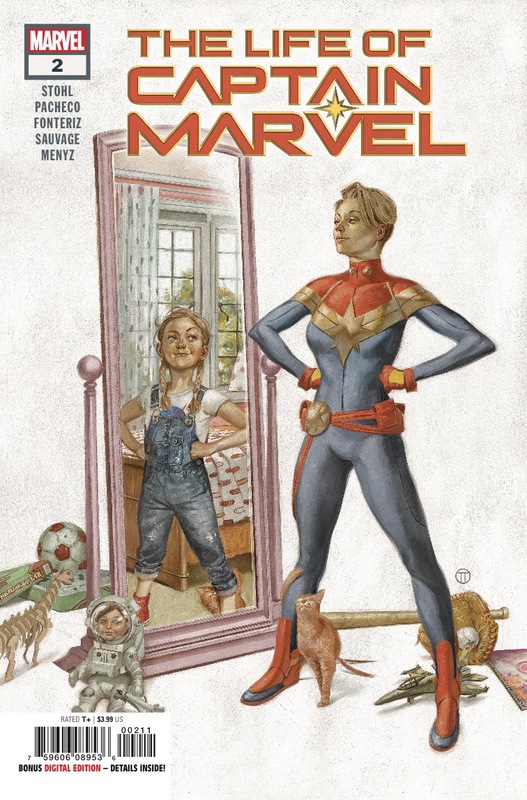 The Life of Captain Marvel #2 Review – AiPT! What does it cost to discover your parent’s secrets? Captain Marvel is a character that has always had the coolest of powers, but the character undeath that costume has had many ups and a lot of downs. Marvel Comics hasn’t done the character justice for long stretches of time but with a movie on the way she’s bound to get the chance to prove she’s a well rounded and interesting character. Writer Margaret Stohl is doing that by bringing her home. Back home in Maine, Captain Marvel has just learned a secret of her father’s she’s wrestling to deal with. This news changes how she thinks about her family unit and more importantly how she looks at her mother. Her dad is dead, but her poor mom needs to know the truth. Much of this issue is about Carol wrestling with this information all while a threat is coming for her. Plus the first issue was quite good. Stohl writes some excellent captions in this issue, drawing you into Carol’s experience and making her relatable. She’s just learned her father has cheated on her mother and it has rocked her world. The story flows from her on the floor of her parents’ home to flashbacks of her father’s funeral (drawn in a sad and striking way by Marguerite Sauvage). The plotting like this helps convey where our minds go when distress hits us. As the story progresses she attempts to get some feedback from close friends and must do the right thing. She’s an adult and should make up her mind, after all, but Stohl makes these scenes believable. As Carol deals with this social calamity the threat teased in the cliffhanger gains steam in a big way. The art in these scenes is excellent by Carlos Pacheco. These scenes do a good job establishing this new alien threat via a familiar alien encounter. As the comic cuts between Carol’s family issues and the alien, there’s a good balance of emotional stress and impending physical danger ramping up the tension of the book until we reach the cliffhanger. The book continues to be paced in a slightly wonky way. A lot of time is spent on Carol’s worry and eventual interaction with her mother in the opening pages. It’s relieved by the alien threat, but Carol’s narrative continues this trend of woe rather than releasing that energy elsewhere. For a book about a hero, some sense of relief and resolution could help give the single issues an arc of their own. The emotional homelife of a superhero is complicated and continues to be the lifeblood of a highly relatable and genuine series. The story is building well and should amount to some major revelations, and fists flying, very soon. Captain Marvel's problems with her family are raw, genuine, and building her character in surprising ways.